Adult Cooking Class Schedule – Spring 2019 Expand your cooking skills and have more confidence in the kitchen. AMG Catering and Events has for many years offered private and group cooking lessons in the comfort of clients’ homes, and now will provide the same exceptional instruction at its brand-new, state-of-the-art facility at 196 Danbury Road in Wilton, CT. (we are located in the back of the Hastings real estate building ( it is a red building with a silo ) If going north on rte. 33 the building is immediately after the Buick dealership on the right . If you get to the stop light. You have gone too far). Chef Grace holds her Masters in Secondary Education from Fairfield University and has taught as a chef/instructor at Staples High School for eleven years. 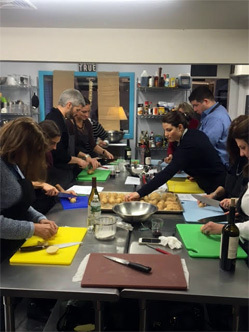 In addition to working creatively with children of all ages, Chef Grace has conducted inspirational, practical, and downright fun adult cooking classes for over a decade through Continuing Education Programs in Westport, Wilton and Ridgefield. Working closely with her adult students, Chef Grace creates stimulating two-hour classes that focus on three to five dishes, depending on the difficulty of each recipe. Classes might revolve around on a theme (international, bite-sized appetizers), a protein (organic chicken cooked five ways), a meal (family-style Sunday supper), a holiday (Thanksgiving side dishes), a dietary restriction (low-fat soups), an ecological concern (sustainable fish entrees) or anything else you and Chef Grace might envision. 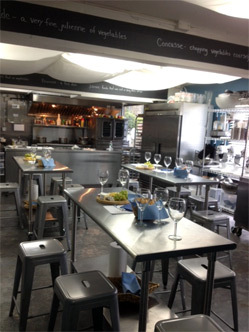 Contact us now to book your next Girls’ Night Out, Bridal Shower, Anniversary Cooking Class or Birthday Celebration. Joining Chef Grace in her culinary instruction will be the dynamic and super-talented Olivia Savarese, who became AMG’s Event Coordinator in 2008, and has now expanded her role as Director of Kids’ Cooking Classes. Born and raised in Paris, Olivia was taught at a very young age to appreciate all culinary experiences. Her father was a restauranteur and she quickly learned all facets of the “back” and “front” of the house. She gained much expertise from working in kitchens with brilliant French and American chefs on both sides of the Atlantic, as well as being an Event Planner for Levy Restaurants, Spiggia Dinning Rooms. Her international experience in the world of food informs and inspires her teaching, as do her two children. Olivia has a magical way of imparting information to kids of all ages and has worked as both a French tutor and a preschool teacher. Meshing her passions for teaching and culinary arts, Olivia offers an insightful and innovative approach to every child who steps foot in the kitchen. AMG Catering and Events is also very proud to present its new Corporate Team Building Series. Chef Grace can engage groups of up to 20 in a friendly but exciting, competitive but supportive “Food Network” atmosphere, modeling her instruction and activities on popular shows like “Chopped,” and “Iron Chef.” By forming teams and facilitating cooking contests, Chef Grace will enhance the team building experience by allowing employees to sharpen their focus, interact positively with one another, and collaborate successfully around making and eating food, the world’s great equalizer.